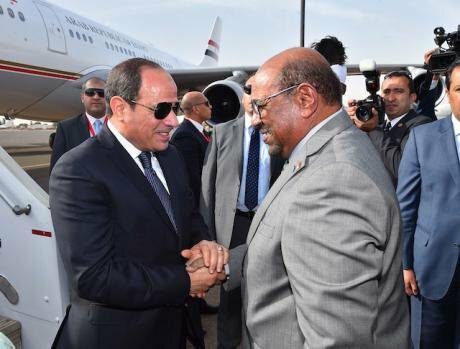 Egyptian President Abdel-Fattah al-Sisi and Sudanese President Omar al-Bashir in Khartoum, Sudan, on July 19, 2018. Picture by MENA/Xinhua News Agency/PA Images. All rights reserved.The continuation of the protests against longtime authoritarian leader Omar al-Bashir in Sudan have understandably been receiving increasing media attention due to the prospect of real political change in the country. Protests, demonstrations, and strikes have now lasted more than a month and have certainly rattled the ruling regime in Sudan as well as several other regional powers fearful of popular protests spreading throughout the region and challenging their own rule. The unrest in Sudan has its roots both in economic hardships caused by cuts to subsidies, shortages of food staples, and foreign currency shortages as well as deeper political grievances stemming from the authoritarian and often brutal rule of al-Bashir. The protests against al-Bashir are by no means unprecedented in Sudan, especially in the last decade. For example, the beginning of the 2011 Arab uprisings in countries such as Tunisia and Egypt helped inspire similar protests in Sudan which focused on worsening economic conditions and the lack of political freedom. In 2013 and again in 2016, protests erupted having been caused by a number of similar political and economic grievances. The most recent string of protests, beginning in December 2018, show no signs of tapering off and may serve as a more serious challenge to the rule of al-Bashir than ever before. In highlighting the uniqueness of this round of protests, some observers have pointed to these protests’ longevity as well as a number of other factors such as apparent rifts within al-Bashir’s own political party and the unity between opposition groups against the ruling regime. The legacy of the 2011 Arab uprisings’ initial successes may give hope that continued protests and demonstrations can bring about real political change. However, while this hope may be inspiring to those taking part in these protests, another legacy of these uprisings may also be hindering those who wish to see tangible political and economic changes in Sudan. In reality, there are at least three factors that are working against the protesters that stem from regional changes resulting from the Arab uprisings. Longtime president Omar al-Bashir rose to power in 1989 as a result of a coup and has, in the years since, solidified his power through a number of means. Security forces loyal to al-Bashir have a history of reacting violently to protests and dissent in Sudan. In the aftermath of the Arab uprisings, there was sure to be reflection and lessons learned from leaders in the Middle East (and beyond) about how to avoid the growth and continuation of protests which eventually led to political change. While other authoritarian leaders in pre-Arab uprisings times certainly had robust security forces to deal with protests, the uprisings provided an illustrative reminder of how protests can grow and eventually represent real challenge to one’s rule. The lesson for some leaders seems to be that only strong shows of force will effectively stifle protests. Al-Bashir’s strategy in Sudan appears to employ this tactic. Sudan security forces have, according to some reports, arrested upwards of 1,000 activists and protesters sending a clear message that the ruling government is taking a tough line against any demonstrations. At least a few dozen individuals have been killed since the beginning of this round of protests, and there are even reports that doctors and other individuals giving aid to wounded protesters have been targeted by security forces. While the arrests of, and violence against, protesters may inspire others to join in the protests to take a stand against an authoritarian regime, the threat of arrest or violence is also used by al-Bashir to remind them of the potentially high price of participation. One more point should be made here concerning the legacy of the Arab uprisings and the future of the authoritarian rulers that it drives from power. In Tunisia, Zine al-Abidine Ben Ali was forced to flee the country, while in Egypt, Husni Mubarak faced a number of court cases that centered on corruption and the killing of protesters. While these outcomes demonstrated a few of the consequences for longtime authoritarians when they relinquished power, the gruesome killing of Muammar Gaddafi in Libya serves as a starker reminder yet of what could possibly happen if a ruler is overthrown. In the case of al-Bashir, there may be little reason for any meaningful political concessions that limit his time in power in light of the possible consequences on his own future as demonstrated by the consequences for other leaders in the wake of the Arab uprisings. At first glance it may seem as though countries such as Saudi Arabia and the United Arab Emirates (UAE) would be unsympathetic to an Islamist president such as al-Bashir facing serious challenges to his rule. Moreover, some may also think that countries such as Turkey and Egypt, having been at loggerheads over a number of issues in the last several years, would also be at odds about the future of al-Bashir in Sudan in one way or another. However, it seems that one common thread running through capitals in the Middle East region is to see al-Bashir remain firmly in control. For many of the regional powers, the foremost reason is that they do not wish to see another instance of popular revolution in the Arab speaking world that drives an authoritarian leader from power. This would, the thinking goes, perhaps inspire protests and calls for change in their own countries. The calculation of countries such as Saudi Arabia and the UAE appears to be that the success of protests to topple an authoritarian regime far outweighs any previous disagreements with Sudan, which were plentiful in the past. While Saudi Arabia and the UAE certainly showed support for Mubarak in the face of the 2011 protests in Egypt, this did not ultimately protect his rule. However, this does not mean that strong financial support to a country that deeply needs to quell economic complaints for the time being may be just enough to stop protests from growing and to placate some segments of protesters. Money helps, especially when economic woes are one of the primary driving factors behind protests. It goes without saying that regional powers such as the UAE certainly seem willing to spend money in Sudan in the midst of this crisis to prevent more upheaval in the region. Al-Bashir may be able to use this financial help to temporarily placate some groups which would weaken the overall number of demonstrators taking part in the protests. While it seems unlikely that protests would completely subside, taking the edge off some of the economic factors driving the protests may assist al-Bashir by helping stunt the growth and longevity of these demonstrations. One would think that the idea of removing a longtime authoritarian leader, especially one who has had an arrest warrant issued by the International Criminal Court, would be a welcome development from the perspective of many western countries. However, there does not appear to be any real support for the protests from western powers apart from statements that express some apprehensions about the way with which the protests are being dealt. The desire for political stability in the Middle East, especially considering the chaos stemming from the Arab uprisings, is sought after for a number of world powers and most likely accounts for this subdued response. While a number of western countries may have deep reservations about the continued rule of al-Bashir, there does not seem to be any strong support to see him removed with the possibility of wider political instability if he would lose control of the country. It is clear that one of the principal reasons for this has to be the effect of increased migration to Europe stemming from the conflicts in Syria and Libya. European countries do not want more instability in the Horn of Africa and North Africa in light of what has been declared by many as an ‘immigration crisis’. This is because Sudan has been reportedly helping to stem the flow of migrants to Europe. This in itself is a clear reason as to why European countries would be hesitant to see the collapse of al-Bashir’s rule. The threat of regional instability in North Africa and the Horn of Africa, the desire to stem migration to Europe, and the overall fear of repeating rather chaotic political changes and transitions in countries that were involved in the Arab uprisings appear to be strong factors that have led to a lack of international support for the demonstrations in Sudan. This issue goes beyond Europe and also involves other world powers. For instance, the promotion of democracy around the world does not appear to be of great concern in President Trump’s foreign policy and little can be expected of the United States in this regard. Moreover, China and Russia also have interests in Sudan and clearly do not wish to see political instability there nor would be interested in seeing grassroots political action lead to political change. It should be noted that even if other countries put more diplomatic pressure on Sudan there is some uncertainly how much effect this might have. After all, Sudan has faced sanctions before and it is unclear what strong mechanisms foreign powers could apply if they wished to exact pressure for the sake of political change. All this is not to say that the protests and opposition against Omar al-Bashir’s rule will fail to have some effect or even eventually lead to leadership change in Sudan. However, there appears to be a number of issues working against the Sudanese protesters, especially in light of the regional effects that are still being felt after the Arab uprisings. The fatigue with the possible risk of further political and social unrest in North Africa and the Horn of Africa is certainly a factor that will continue to persist both inside and outside the region going forward. Even with all of this working against the Sudanese protesters, there is nonetheless a real hope that their primary goals can prevail. Protests concerning economic and political problems have been increasingly common in Sudan and the lack of any real progress to address these issues could further drive them as we have already witnessed. Perhaps these protests and the activists feel as though there is nothing to lose and will continue on while divisions within al-Bashir’s ruling party weaken his grip on power. The developing situation in Sudan will be instructive concerning the future of protests and political change in the Middle East and the North African region especially concerning the strong currents working against democratic change in the region. The protesters in Sudan have shown resiliency and may demonstrate that even with these challenges, real political change in the Arab speaking world may still be possible.